One of the coolest things about having a twin sister is that you get to share friends. 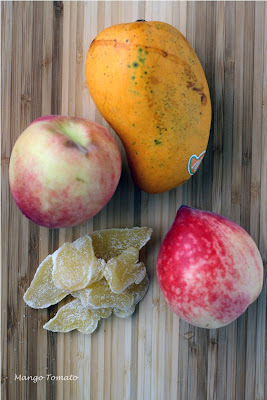 What does this have to do with a recipe for Mango, White Peach & Crystallized Ginger Frozen Yogurt? Well, Anna introduced me to her friend Erica about 3 years ago. We took a trip to Montreal together and had a great time. All of us love food, fashion exhibits at museums, botanical gardens, etc. When Erica moved to DC about a year ago, we got to know each other a little bit better. One of the facts that Erica found out about me is that I like red appliances :) So a few weeks ago she emailed me asking if I'd like to have her 1.5 quart ice cream maker because it's red and because her husband encouraged her to de-hoard and make room in their apartment for their baby!!! I thought about it and said YES. And then I started thinking: what should I make in the ice cream maker? 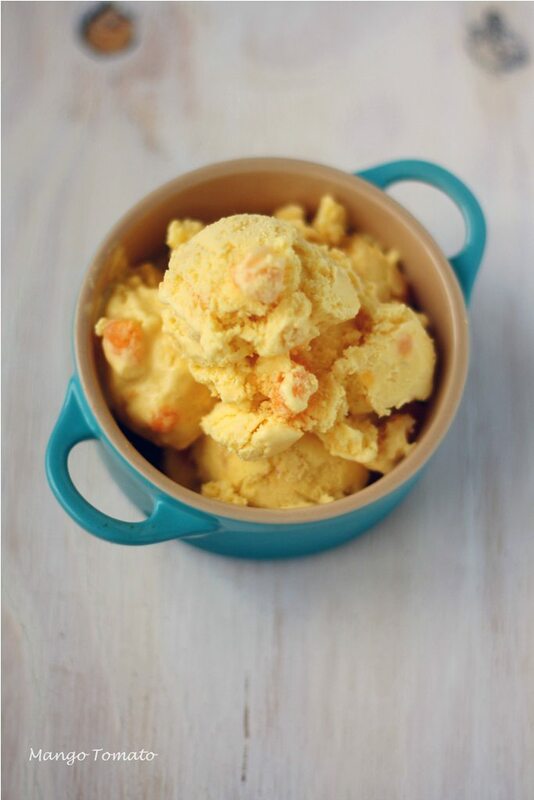 After spending some time browsing Jessica's Frozen Fix site, I decided I simply must make something with a mango. But that would be slightly boring. I decided to add a white peach (because they were on sale at the grocery store) and crystallized ginger (because I had some in my pantry and thought it'd add a nice texture contrast). I used this recipe as a template, but changed a few things to fit my taste. 1. 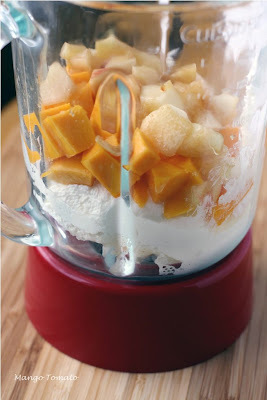 In a blender, puree 1/2 of the mango, the white peach and the drained yogurt. 2. 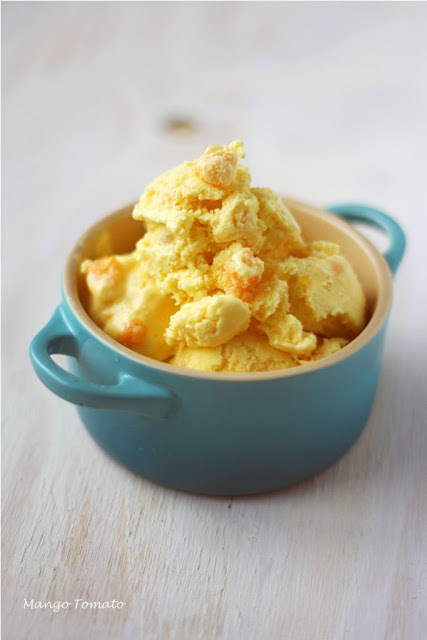 Add the mixture to your ice cream maker and follow the manufacturer's directions. 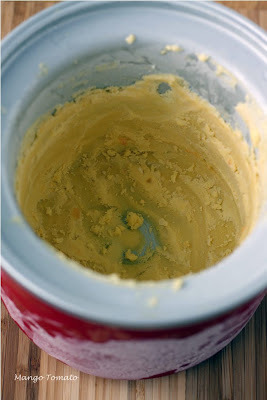 I churned mine for about 15 minutes and when the mixture was getting pretty solid, added the nicely diced half of the mango and crystallized ginger and churned the yogurt for another 5 minutes. 3. 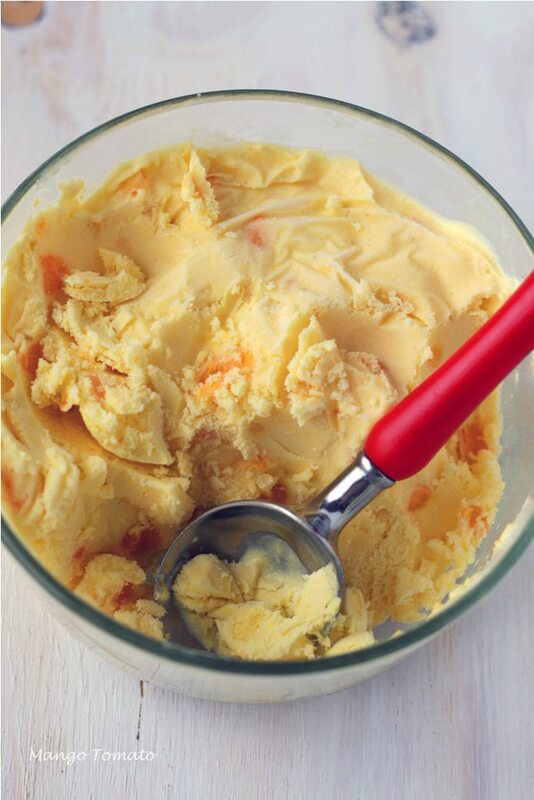 Transfer the frozen yogurt to a glass container and put it in your freezer. If you look at the photo above (the one on the right), you'll see that some of the yogurt got pretty stuck to the inside of the bucket. I just let it melt and ate it with a spoon: it was incredibly good. And the color! Seriously gorgeous. I loved the bright orange chunks of champagne mango in an otherwise orangey-yellow yogurt. And the bursts of crystallized ginger added a bit of spice to this mild yogurt. Also, please notice my DYI white-washed board I will now be using as my background. Huge thanks to Cindy and her family for taking me to Home Depot to get supplies for this project and to Lori of Recipe Girl for the inspiration. This looks incredible. What a great flavor combination. An ice cream machine is on my list of indulgent purchases. It's next, the next time I come into some expendable income. Looks so tasty! Don't you love it?? It looks awesome!! Love the backgrounds - whitewashed board especially. DYI is the way to go! I have lovely peaches from the farmer's market and home-made crystallized ginger from David Lebovitz's divine recipe http://www.davidlebovitz.com/2008/12/candied-ginger/ . Have to run out to get a mango - and will do it even tho it's pouring rain - because this looks so yummy. I've had the same problem with "too frozen" results when I used ice cream maker, but mine was with ice cream made with whipping cream, so I don't think the lack of fat is the issue. Hope comments to this post enlighten both of us on how to improve texture. For now, I use handy scoop with hollow for warm water in handle - it helps a lot in getting scoop to glide through frozen yogurt/ice cream. Looks great! Frozen yogurt is best eaten fresh out of the ice cream maker. The high water content means it's icy after you put it in the freezer. Another way to keep it creamy: alcohol! What a great gift! I love red appliances and ice cream. Dessert looks irrestible dear.. Best to have it after a dinner course..
How do you think this would work as a smoothie, since I don't have an ice cream maker? This sounds so good! I haven't made frozen yogurt in our ice cream maker yet, but with the recipe I'm definitely going to give it a try. We have lots of blueberries right now, so I might make an adapted version if I can't get my hands on some good mangoes! Such a beautiful color, looks delish! The white washed board looks gorgeous! It really makes your turquoise Le Creuset pop! Oh, and of course, the frozen yogurt looks delicious. Some sugar and using full fat yogurt might have helped. 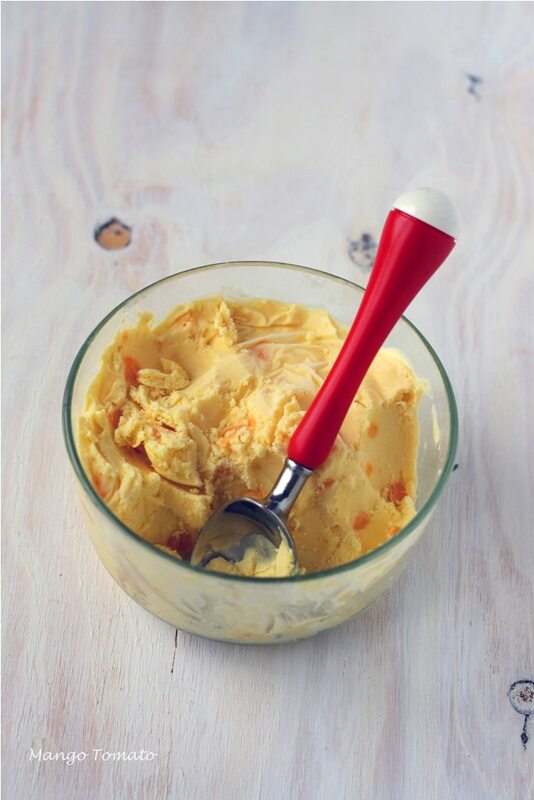 But usually yogurt produces a hard frozen end product, less creamy than using whipping cream. A tablespoon of vodka or any other liquor would help with hardening as well. Looks delicious. I love fro-yo. I would probably eat it soft-serve style right out of the ice cream maker and not even freeze it. Looks great, and the flavour is fabulous. Let me know if you figure out the secret to freezing yogurt! I have never been to Fro Yo, it`s one of my little secret wishes...but this looks just as good! Looks like you picked the perfect thing to make! 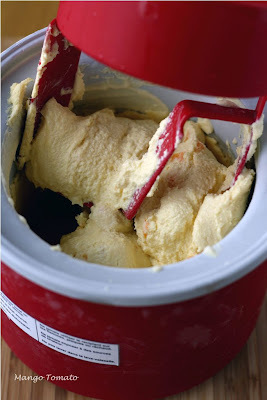 Your red ice cream maker looks great! I think I could make ice cream, sorbet, or something frozen every day in the summer. Your frozen yogurt sounds delicious with the mix of fruits and ginger. The fact that it gets too hard is a problem with homemade icecreams I have understood. I have the same issue especially with yogurt based icecreams. I've heard it helps to ad one or two tbsp of alcohol to prevent it freezing to a solid block. But it's definitely best eaten directly from the container! Looks delicious Olga! love the white-washed backdrop and the mini-pot! I don't have an ice cream maker -- could you use the same concoction to make mini-pops in a zoku or something? I've tried making sugar-free frozen yogurt like this a bunch of times and always have the same problem. Alcohol is often suggested but I haven't found it makes a huge difference, and neither does xantham or guar gum (at least on my experience). I guess the best solution might just be making smaller batches and eating it quickly! I sooo need a friend to send me their ice cream maker. If I had one, I would definitely try this recipe. The combination of mango, peach, and ginger sounds fantastic.